Vittorio Holst) - above - see details on the drop down menu of Drumhowan Stallions under his name. Fantastic results for Limestone Grey (Try Time) at Dublin 2016! 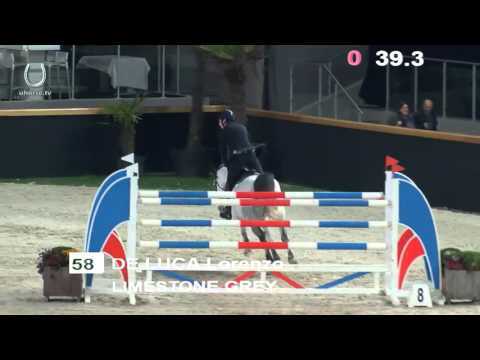 Lorenzo de Luca has done it again, the Irish Sport Horse, Limestone Grey, has won his third class of the week, The JLT Dublin Stakes. Limestone Grey, one of the handful of foals sired by Try Time (Numero Uno) before his untimely death at a very early age from colic. Here at Ringfort we have another of his rare progeny, Lady Portiana (ex a Cavalier Royale mare), who has bred a stunning Zirocco Blue, now a yearling gelding, and has been inseminated with Je T'aime Flamenco for 2017. STOP PRESS! 1.60 SHOW-JUMPER, CAVALIER RUSTICANA, ONE OF ONLY HALF A DOZEN FOALS BY TRY TIME, WON THE PUISSANCE (2 METRES.15) AT CAVAN INTERNATIONAL, NOVEMBER 2015. Cavalier Rusticana (who like Lady Portiana is by Try Time out of a Cavalier Royale mare) then went on in January 2016 to win the Liverpool international Puissance with a final wall of 2 metres 17!! Lady Portiana has had her foal - a colt born on 18th May 2015! He is definitely going to be grey like his sire! Lady Portiana is by Try Time - small picture above - (by Numero Uno out of one of the best marelines in Holland - Minka by Topas, in a direct line to jumper OKI Doki and dressage legend Totilas). Try Time tragically died of colic at the age of seven just as his breeding career was getting underway. From only half a dozen foals, his progeny include Cavalier Rusticana, also out of a Cavalier Royale mare, who won the Puissance at Cavan International November 2015 – jumping a height of 2 metres 15! And then went on to win the Liverpool International Puissance in 2016 jumping 2 metres 17! Lady Portiana's dam is Moystown Princess by Cavalier Royale who has some good performing offspring already, including 3* eventer, Borneo Royale by The Artist, exported to the US and ridden at Advanced level by Nora Battig who says: "my horse was sensational. I was a teenager when I had him and he won just about everything. So much heart and talent in that horse. I look forward to seeing the foals you have. Someday I would love to have a relative of his." Another half-brother was 1.30 show-jumping horse, Oakenes Titan by VDL Douglas. Oakenes Titan by VDL Douglas, half brother to Lady Portiana, was jumping successfully at 1.30 level as a seven year old when he had to be put down following an accident in the field. (The photographs are of him jumping as a five year old in 2010). Another half-brother, a gelding by Shannondale Sarco out of Moystown Princess, was purchased by the stallion owner from the breeder as a foal. With the current, much to be applauded, concentration on damlines in breeding, it is always good to discover another potential superstar in one's broodmare's breeding. There is a three year old half-brother to our broodmare Lady Portiana. She is by Try Time (Numero Uno) out of Moystown Princess by Cavalier Royale. She already has a couple of half-brothers competing successfully at a decent level (including one at international 3* eventing, and another who unfortunately was injured and euthanised while show-jumping at 1.30 level) but this is a younger gelding out of Moystown Princess by Shannondale Sarco (by Darco out of a Voltaire mare) who would appear to have all the attributes of a star of the future. Moystown Sarco - take a bow! Now exported to the United States for a show-jumping career. Lady Portiana (on left, above) is a good mover and has a very scopey jump but she was just starting to compete when she sustained a kick in the field which damaged a tendon and cut short her career. It is to be hoped that her new career in the breeding paddock will be highly successful.